Nobel Laureate Robert Merton: Is U.S. Job Growth Happening in Vietnam? 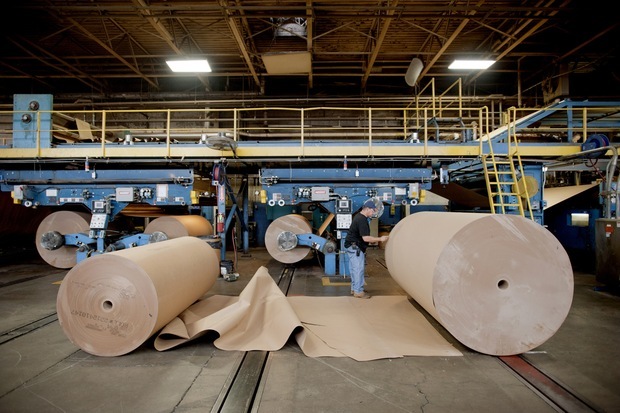 An International Paper Co. employee works on the floor of the company’s factory in Mt. Carmel, Pa. The company was one of 35 big U.S.-based multinational companies to add jobs faster than other U.S. employers in the past two years, according to the Wall Street Journal. Photo by Paul Taggart/Bloomberg via Getty Images. The last sentence alludes to a debate we’ve visited several times on the NewsHour, in “Can America’s Jobless Fill American Jobs?” and, tangentially in “The Great Stagnation: Why Hasn’t Recent Technology Created More Jobs?” Is unemployment in this era a function of structural vulnerabilities — to global competition from cheap labor, for example — as opposed to cyclical, in which the economic downturn explains high unemployment, which an inevitable upturn in the business cycle will solve? Not all Keynesian programs would bleed jobs abroad, though. As a moderator at the Harvard’s Institute for Learning in Retirement last week, I listened to former Pennsylvania Gov. Ed Rendell make the case for short-term spending projects in infrastructure, education, research and development. I’m not sure that research and development spending would all stay within the United States, but it’s a safe bet that infrastructure and education would. I’ll soon be spending a day with, and profiling, Paul Krugman, another Nobel laureate. He will, rest assured, have plenty to say on this issue, as does his new book, “End This Depression Now!” Merton has more to say as well. I hope to be sharing some of it with you here.